Habit: Annual, occasionally scapose. 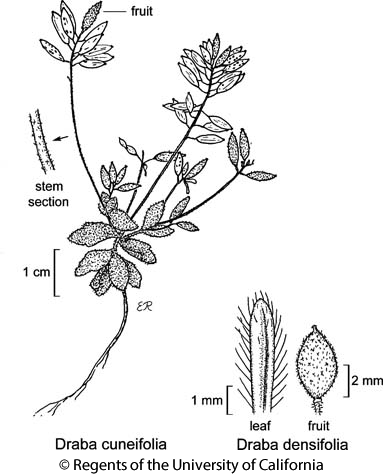 Stem: (2)3--27(37) cm, simple, hairs 2--4(5)-rayed, base with simple hairs. Leaf: basal not rosetted, (0.4)1--3.5(5) cm, oblanceolate to broadly obovate, dentate, hairs stalked, 2--4-rayed, occasionally mixed with simple; cauline leaves 0--6. Inflorescence: 10--50(70)-flowered, elongated to +- congested, not umbel-like; axis hairs 2--4-rayed; pedicels (1)2--7(10) mm, hairy. Flower: sepals 1.5--2.5 mm; petals (2)2.5--4.5(5) mm, 1--2 mm wide, white, or late-season flower petals 0. Fruit: (3)6--12(16) mm, 1.7--2.7(3) mm wide, oblong to linear or broadly ovate, flat, not twisted, hairs simple or 2--4-rayed (glabrous); style to 0.4 mm. Seed: (12)24--66(72), 0.5--0.7 mm, ovoid. Chromosomes: 2n=16,32. Unabridged Note: 3 +- distinct varieties, all occurring in southern California: Draba cuneifolia var. cuneifolia (eastern & southwestern United States, northern Mexico) has fruits with simple hairs; Draba cuneifolia var. integrifolia S. Watson (to Utah, Texas, northern Mexico) has fruits 7--12 mm, 20--44-seeded, with (2)4-rayed hairs; Draba cuneifolia var. sonorae (Greene) Parish (Arizona, northern Mexico) has fruits 3--6(8) mm, 12--24-seeded, with (2)4-rayed hairs. Citation for this treatment: Ihsan A. Al-Shehbaz 2012, Draba cuneifolia, in Jepson Flora Project (eds.) Jepson eFlora, http://ucjeps.berkeley.edu/eflora/eflora_display.php?tid=23332, accessed on April 24, 2019.
s SN, SnJV, SW, W&I, D; Markers link to CCH specimen records. Yellow markers indicate records that may provide evidence for eFlora range revision or may have georeferencing or identification issues. Purple markers indicate specimens collected from a garden, greenhouse, or other non-wild location.